The SJMSL is housed in Mary Harmon Bryant Hall. 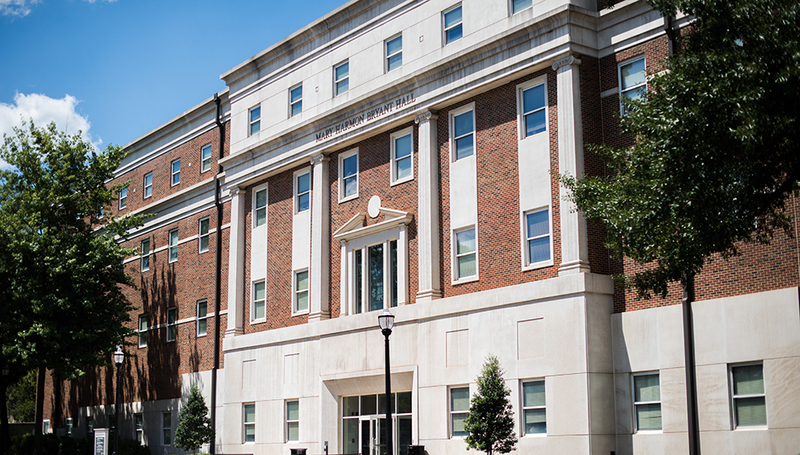 Located in Mary Harmon Bryant Hall, the Steven Johnson Molecular Systematics Laboratory (SJMSL) is a community facility for UA researchers conducting research using molecular methods. The laboratory includes space for DNA sequence and fragment analysis, an adjacent room for specimen preparation, and a small viewing room for UV transillumination of gels. The main laboratory includes adequate counters, tables, and equipment for DNA sequence and fragment analysis for several researchers working simultaneously. The laboratory is roughly divided into two equal areas, the north wing being used largely for specimen preparation and DNA extractions and the east wing being used primarily for DNA analysis. The east wing of the laboratory is devoted to DNA research and includes three island workstations adequate for four to eight researchers per island. The east wing is used primarily for DNA amplification via PCR and automated DNA sequencing and fragment analysis. The SJMSL contains two fume hoods, an autoclave, an ice machine, a drying oven, a purified water system, numerous centrifuges including vacuum and chilled centrifuges, gel electrophoresis equipment, several thermocyclers, a NanoDrop, an ABI 3100 Automated DNA Sequencer (16 capillaries) for DNA sequencing, an ABI 310 Automated DNA Sequencer (single capillary) for DNA fragment analysis, and a pH meter.